18th April 2016 – As is tradition, the month of April is awash with marathons and PACE athletes have been more than holding their own in races across Europe. Getting things underway was former Olympic Bronze medallist Micah Kogo (KEN) who ran his best marathon since 2013 and placed fourth in a highly competitive Paris race clocking 2:08:03. Next up was the husband and wife duo of Moses Masai (KEN) and Doris Changeywo (KEN). Moses was running his first marathon for two years and gave a good account of himself placing third in 2:15:43 in very blustery conditions over the Hannover course. Doris who was victorious on her marathon debut in Singapore also placed third in Vienna but did have the satisfaction of recording new personal best figures of 2:31:50. 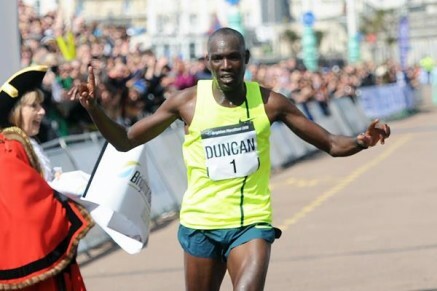 Duncan Maiyo (KEN) successfully defended his Brighton Marathon title executing his race plan to perfection and moving clear in the final three miles. He broke 2:10:00 for the first time crossing the line in 2:09:55. Completing this busy period will be Chris Thompson (GBR) who will be looking to secure his selection for the British Olympic Team as he races in London this coming weekend.